SF State's Jazmine Williams (7), spikes the ball during the game against Seattle Pacific University Tuesday, Sept. 4, 2012. SF State Gators won the match. Photo by Alejandrina Hernandez. The women’s volleyball team opened their season with a victory on the home front against Seattle Pacific Tuesday night. 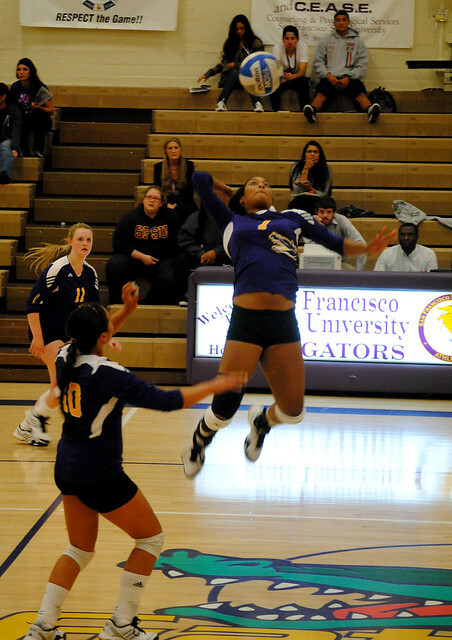 The Gators put up a season-high 60 kills and maintained a dominating force over the Falcons throughout the match. Four players posted double-digit kills with freshman Meagan Wright leading the group with 14. Senior Megan Johnson and sophomore Kelly Ostello trailed right behind with 13 kills a piece. Ostello believes the connection on the court played a major role in their win. In the first two sets, the Gators were leading with a solid .373 attack percentage, doubling Seattle in kills. The Falcons failed to string together passes to create opportunities to attack, and the Gators took full advantage. At the start of the third set, the Gators became too comfortable with their lead, and Seattle Pacific saw a glimmer of hope. The Falcons, led by Nikki Lowell’s five kills, managed to come together for a defeat of 25-23. With energy low and momentum building in the wrong direction for the fourth set, the Gators maintained composure and finished strong with an outstanding 15 kills. Setter Iris Tolenada came close to matching her season high with 49 assists, and gives credit to her hitters for the successful home opener. Head coach Michelle Patton also believes that this win laid a foundation down for the Gators to only build on with the right tools and hard work.